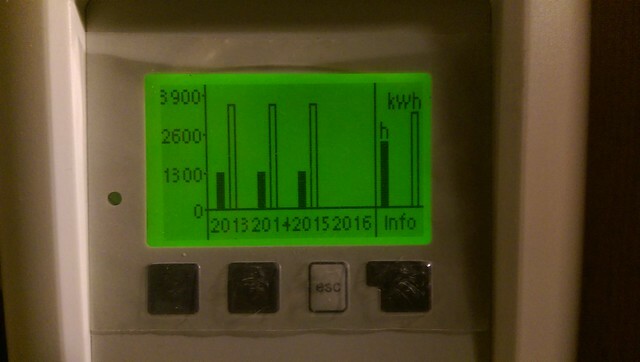 Rather suspiciously, the controller reports almost identical kWh outputs for the last three years. I will estimate it as 3,800 kWh per year. Nottingham Energy Partnership have an Energy Costs Comparison table. I neglected to look at it last year, so will have to use the data from last month now to estimate the financial value of the heat we got from the sun. I use the gas rate of 5.19p/kWh, since if the water were not heated by the solar panel, it would be heated by gas. That means the solar panel gathered around £197 of energy in each of 2014 and 2015. The running total to the end of 2014 is therefore £1,187 and at the end of 2015, £1,384. September will see the ninth year of operation. When it was installed, we needed to put in a new hot water tank which was bigger than the old one, so the installers had to demolish my airing cupboard to fit it in. In the nine years since, I have yet to sort it out.